Connecting back handspring series on beam | Swing Big! So today I’m going to talk a little about back handsprings on beam. 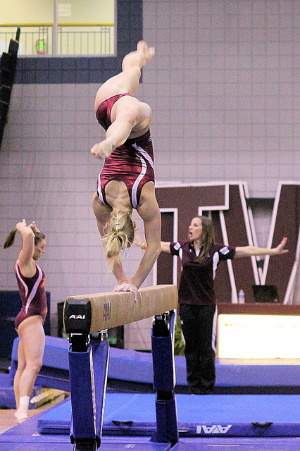 Or, possibly better, back handspring SERIES on beam. If you’ve been in the gym for any length of time you’re probably very aware of the trouble some kids have connecting their series, and possibly some of the methods coaches use to correct this. I’m a big fan of mixing it up. Back handspring series on the floor, 1 back handspring on the beam connected to another back handspring that goes off the beam to a panel mat, back handsprings off a spring board onto the beam etc. The more I can mix it up, the more confident I think kids get. That being said here are a couple drills you may like. I LOVE this drill. I think it gives kids a lot of confidence, it often fixes bent knees and it feels a little more like what they will experience coming out of their first skill. Notice that her arms are up the entire time. Let me note, this is another one of those you may want to spot first. Kids don’t understand the feeling at first and I’ve seen a lot of arms buckling, could land on head type situations from this kind of thing if you don’t spot the first few. This second one is the same as the first but put on the beam. I think it gives kids a more realistic feeling of what coming out of their first back handspring is like, so I like to introduce this drill early even if we are just starting to put back handsprings on the beam. Your blogs are so helpful!